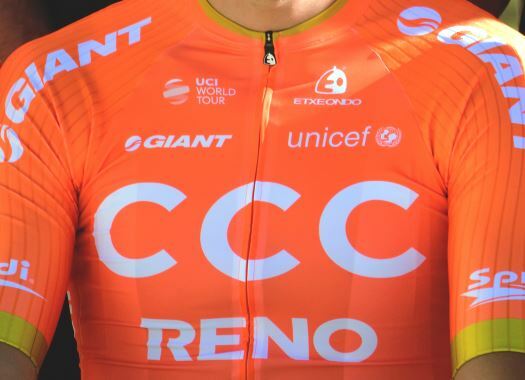 CCC Team's Patrick Bevin has successfully defended his GC lead at the fourth stage of the Santos Tour Down Under. Bevin arrived with the peloton at the bottom of the last climb of the day and was part of the chase group that eventually caught the riders that took an advantage at the ascent. The New Zealander was part of the final sprint and crossed the finish line in the second position behind Mitchelton-Scott's Daryl Impey, extending his overall lead. "That was a very tough day," Bevin commented. "I knew coming down the gorge, it was still a long way to the finish. The race didn't finish on top of the climb. It was really hard to stop us coming across in the downhill. I took the onus up as much as I had to on the descent. As that group got bigger it was at the point where if I could take any time bonus, it was good. Any is better than none and I wasn't going to risk losing time to anyone. "It was a bit unfortunate to come to the top with Daryl [Impey] but coming second on the stage and keeping the lead is kind of the best-case scenario for me. We as a team had a lot of help before because we told them we're not going to be the only team to work again all day. There are still two types of guys who can win the overall: the sprinters who can climb, Daryl is the first of them, and obviously, there's Richie [Porte]. From now on, for us, it's about managing both parties." Bevin wants to take some more time on the next stage to have a good advantage on his rivals ahead of the Willunga Hill stage. "To give up four seconds to Daryl is a great result at the end of the day because I don't feel like he is climbing better than I am and we put time into the pure climbers," he explained. "It would be great to take more time tomorrow. That would be a real step towards the final day in Willunga because I'm still only 21 seconds over Richie before Willunga. It's not a huge buffer. Fortunately, this race is about being an all-rounder. Basically, you have to sprint better than the climbers and climb better than the sprinters."